Does Hypnosis Work? Indeed it Does! Hypnosis Group Hypnotists can help you regulate your behavior, remove negative thoughts, and use your mind to regain control of your body in a beneficial way. Hypnosis is a powerful tool which can help you with a number of life's challenges. Hypnosis is a pleasant state of relaxed mental focus which could be compared to a pleasant day-dream. Most would be surprised to know it does not require having the eyes closed or even remaining quiet and still. Sometimes a hypnotic technique is used where the person actually speaks to the hypnotist or the person is asked to open their eyes to deepen the level of hypnosis. 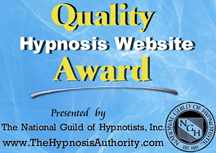 Hypnosis is a natural state and was endorsed by the American Medical Association in 1958. A person undergoing hypnosis always remains in control and would disregard any suggestion that is not agreement with their morals, beliefs or values. If you are concerned that you might become so relaxed that you fall sleep, don't worry your hypnotist will insure that you remain awake to receive the full benefit of your hypnotic session! Protecting your privacy is very important to us. Our discrete office locations, will insure everyone thinks you are naturally fabulous!. The records we keep are for your benefit only, and private from everyone else. All sessions are video recorded for your safety and quality assurance review.